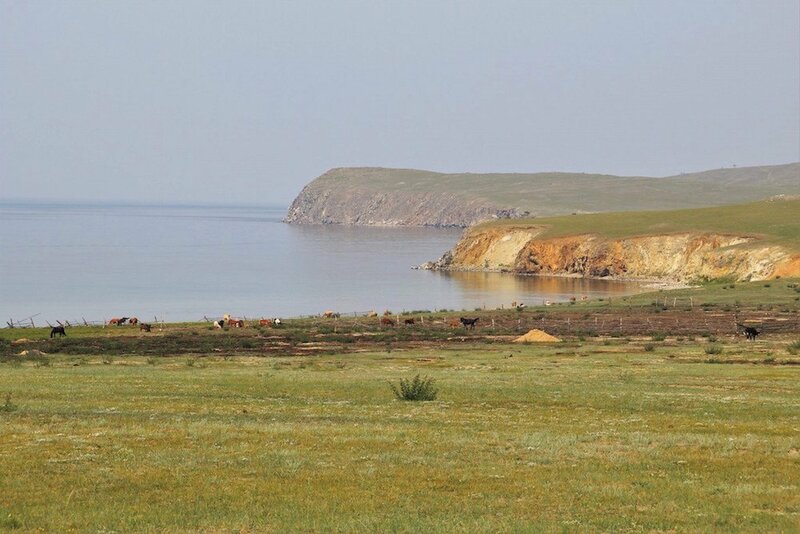 Set in the pristine waters of Lake Baikal, the island of Olkhon has been the centre of Buryat Shamanism for centuries. As tourism and ecological damage sets in, is this native spirituality now under threat? It was the last place I expected to find an Irish pub. Harat’s Pub Nadezhda sits in almost complete isolation along the dusty road which leads to the village of Sakhyurta, where tourists and locals catch the regular ferries crossing the narrow strip of water to Olkhon Island. We have driven for six hours already; beginning in Listvyanka, a popular resort town on the south-western shore of the lake, stopping in Irkutsk to pick up our guide and then on toward Sakhyurta. Harat’s is our last stop before boarding the ferry to the island. Stretching 70 kilometres long and 15 kilometres wide, Olkhon is the largest island on Lake Baikal — the Siberian lake which holds more freshwater than all of the North American Great Lakes combined. 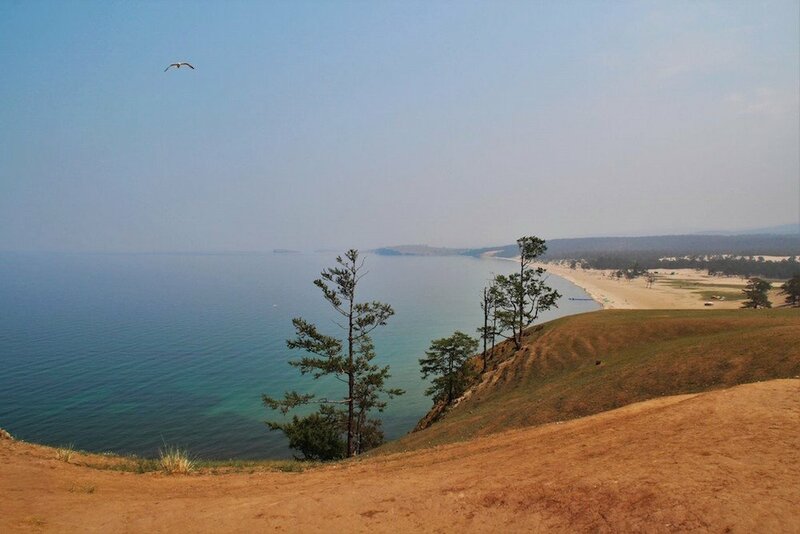 Baikal is a place bathed in mystery, but no part of the lake is home to more myths and legends than Olkhon. 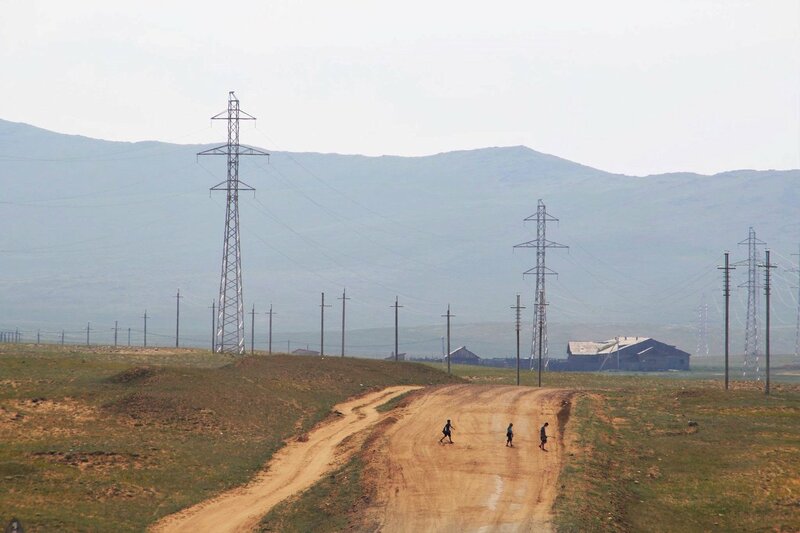 For centuries, Olkhon has been inhabited by the native Buryat — a northern subgroup of the Mongols. The island is regarded as the sacred centre of Shamanism in the northern hemisphere and is believed to be “one of five global poles” of shamanic energy. Shamanism is not a religion. There is no fixed dogma, no strict set of beliefs — and no sacred book. It is more a way of life, built around the belief that the visible world is penetrated by invisible energy forces and a spirit world that affects our lives. The most powerful shamans are believed to maintain the ability to heal the sick, control the weather and act as mediums between both worlds. At its core, shamanism is about spiritual healing through the strengthening of our human connection to nature. The word “shaman” itself means “one who knows”. Stories about the birth of the lake have been passed down through the generations. One legend tells of a dragon swooping down from the sky, creating Baikal with a swoosh of his giant tail. The more common story tells of a massive earthquake which opened a huge crack in the land, from which unstoppable lava began to spout. The Buryat people begged the gods for mercy, and, faced with inevitable death, began to scream: “Bai, Gal!” — which translates as, “Fire, stop!” As quickly as it had appeared, the lava retreated and pure, clear water began to fill the hole that was left in the earth. Traveling on board with a post van delivering mail to the islanders, we reach Olkhon after a 15-minute crossing. Our guide leads us to an old UAZ van, which will be our mode of transportation for the day. 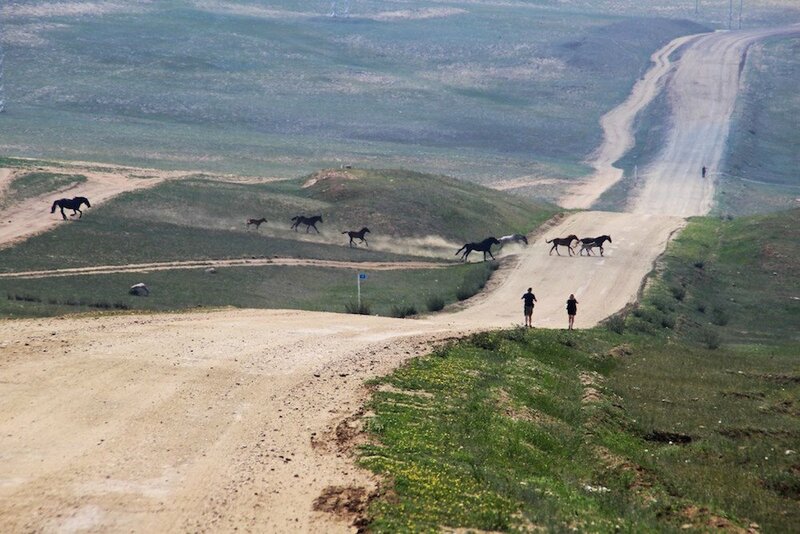 Soon we’re off, hurtling towards Khuzhir, the largest settlement on Olkhon with a population of roughly 1,200. I had read that Olkhon was known for spontaneous weather changes, and as we drive, I can’t be sure whether the sudden strange cold I feel come over me is real or a figment of my imagination. The beauty and peaceful isolation of the island hits you immediately; pristine sandy beaches, steep cliffs, enchanting rock formations and water so clear and fresh you can drink it directly from the lake. It is a place that would turn even the most ardent skeptic into a believer. Our first stop was Cape Burkhan, more commonly referred to as Shaman Rock. Legend has it that Azhin, the Lord of Lake Baikal, lives in the cave at the rock and local shamans still perform cleansing rituals there. Others believe the cave is the true burial place of Ghenghis Khan. Vladimir Obruchev, a Russian scientist who explored the area in the late 1800s, wrote about the remarkable superstitious fear that the Olkhon Buryat had toward the cave. Obruchev noted that it was impermissible to ride past the rock on wheels, only on horseback. Even then, horses hooves would be covered in felt and leather in order not to disturb the cave’s inhabitants. Back in the centre of Khuzhir, shielded from the sun in a large tent, locals serve us a lunch of Omul fish soup with jam blini for dessert. Omul, the whitefish species endemic to Lake Baikal, have been intermittently endangered for years. During the Soviet era, the island was home to a “mini gulag” where prisoners worked at a now-abandoned fish factory not far from this town. Today, a two-year ban on fishing Omul is cause for concern among the local fishmongers around the lake. But the endangerment of Omul is far from the only ecological issue plaguing the lake and its islands. Once famed as the purest water on the planet, Baikal’s water quality is diminishing due to pollution from both household waste, chemicals used by local farmers and increasing tourism. 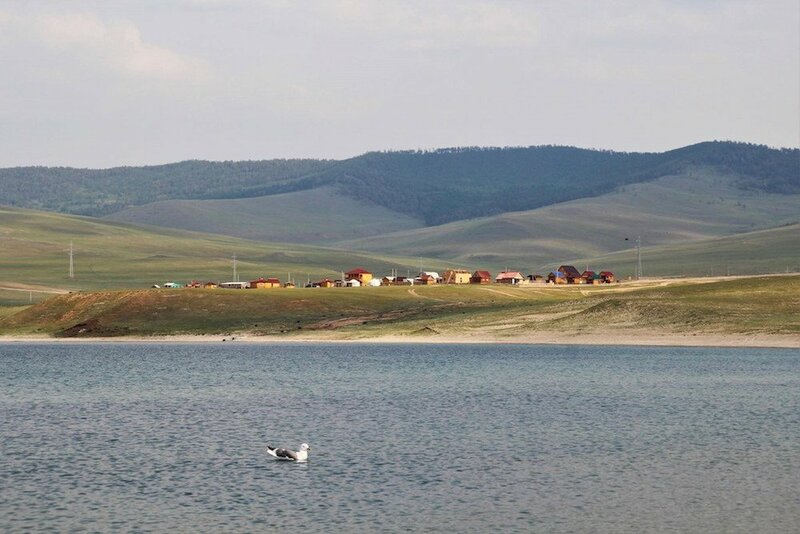 While the water around Olkhon remains pure, the water in the southern end of the lake is no longer drinkable, according to scientists. A Soviet-era paper and pulp mill, which operated until 2013, has also been a factor in the lake’s contamination. For years, the factory spat pollutants into the waters of Baikal — and even after its closure, environmentalists warn that chemicals abandoned there are seeping into the lake. The drive to our next destination verges on perilous. The bus shakes violently on the uneven terrain, our heads hitting the ceiling too many times to count. Stones smash against the underside of the bus as we jolt vigorously from side to side. At the top of the hill, we’re attacked by a swarm of flying insects that look like dragonflies. But the view is worth it. To our left we look down over the Khuzhir settlement and to the right we observe the thick pine forests which stretch across most of the eastern part of the island. We spend a while listening to stories about the history of the island before we’re off again — this time headed for Togay Bay and Khankhoy, a lake within the island itself. Three or four kilometres shy of our target, the bus starts to grumble. We carry on for as long as it will take us until the engine gives up and we roll to a halt. Our frazzled guide gets on the phone looking for help. No other van is available for at least a couple of hours, so we decide to continue on foot. It turns out to be the most serendipitous of breakdowns. As we near the bay, we hear a rumbling up ahead and look to see a team of 20 or more horses galloping across the fields and road in front of us. Adults and foals together, dust rising from their hooves, they are heading to drink from the lake. The scene gives me goosebumps. We watch as the horses come to a stop by the water and we move on in the same direction, eager for our own rest. Khankhoy Lake is separated from Lake Baikal by a rocky ridge on one side and a sandy spit on the other. We sit on the sand at Baikal’s edge. Here the water is so pristine and fresh it looks no different than bottled water bought in a store. We decide to risk it, fill up our bottles and gulp them back. As the evening sets in, we make our way towards the dock to catch the ferry back to Sakhyurta. 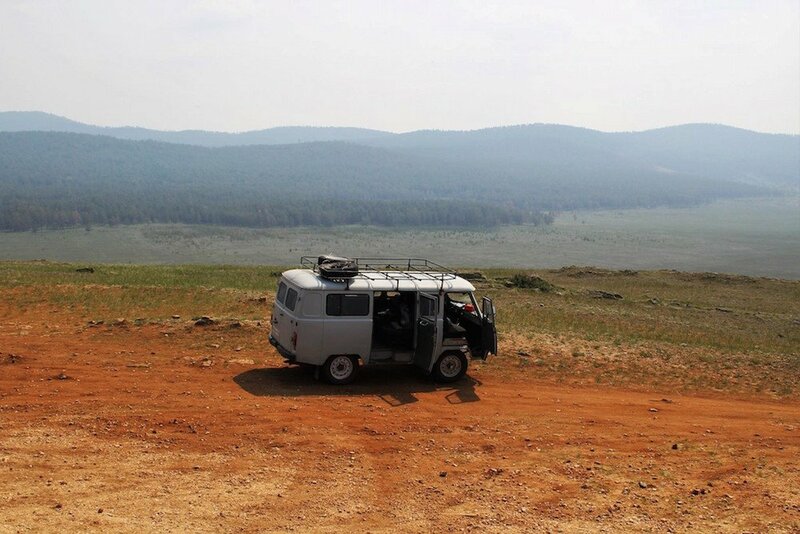 It will be a while before we stop for borscht and pelmeni in a yurt-shaped restaurant on the long road back to Irkutsk. As our boat drifts away and the evening air begins to cool, I imagine what life here is like when winter sets in; when a dense fog falls over the lake and the water freezes metres thick. Legend has it that the shapes of horsemen can be seen approaching in the distant fog over a frozen Baikal. These days local newspapers report on convincing mirages which suddenly appear out of nowhere; mysterious villages hang above water, trains roll silently across the ice, castles and ships suddenly materialise in the distance. For now I am content to leave these eerie thoughts to my imagination, but I wonder for how long. Olkhon is a place that calls you back.